The most important consideration in choosing an LCD display is the controller. Lumex employs various controllers from Toshiba, Epson and others. The actual selection is based on the resolution of the module. There are three basic display types, TN, STN, and FSTN. However, only STN and FSTN have the response time to be used in graphic modules. DFSTN is used in high end applications that have very specific criteria. Backlights also come in three basic varieties, EL, LED, and CCFL. 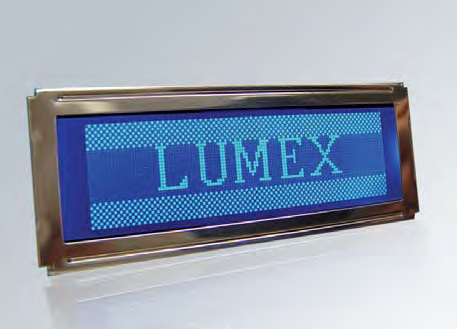 Lumex predominately uses LED backlights when possible. Lumex offers a wide array of color options to enable brand differentiation. The two basic viewing angles are defined as 12:00 and 6:00. A 12:00 display is best viewed below eye level, and a 6:00 display is best viewed above eye level. Lumex can offer near infinite variations to custom graphic modules. This ranges from the full custom COB, COG, COF, TAB architectures to full integration with the inclusion of LED indicators, switches and additional logic. Semi-custom solutions are available, such as custom LED backlight colors or specialized PCB options.